Chris's Blog - A View from Shepton: Why Politicial stunts always come home to roost! Why Politicial stunts always come home to roost! 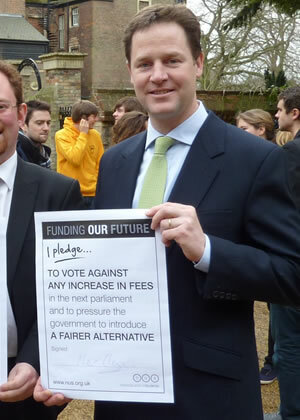 How Nick Clegg must regret the now infamous pledge on tuition fees and not to increase them in the next parliament. Knowing the parliament could be hung, and if he meant the pledge, he should not have agreed to increase tuition fees to a maximum of £9000, or he should not have involved his Party in the student campaign at all by signing the pledge. The reason the backlash has been so strong against Nick Clegg and the Lib Dems is easy to understand. In the TV debates, Nick Clegg looked into the camera and promised a new sort of politics, one based on trust. Cleggmania took hold, but within a week after the election promises on tuition fees, EMA, VAT and cuts to frontline services and top down reorganisation of the NHS were broken. The public know this is a Conservative government albeit with Lib Dem support. YouGov’s most recent nationwide survey, involving nearly 50,000 people, shows that as many as 69 per cent of Lib Dem voters have deserted the party since last May, Of the Lib Dem deserters, 2m would now vote Labour. Such a dramatic fall in support is undeniably bad news for Clegg. He was able to woo voters last year, as previous Lib Dem leaders had done, by presenting his party as a progressive force that could keep the Conservatives at bay. So from all polling data is Britain is basically a progressive country, this is why local Lib Dems are so keen to demonise local Conservatives. It would be laughable if not true, local Lib Dems supporting Eric Pickles, when the same Eric Pickles is the government minister than created a funding formula for local government that the Mendip's Conservative leader was upset at it's lack of honesty, the headline reduction was smaller than the actual cuts required and the timespan too small. So to the moral of this story, political stunts always come home to roost, either tuition fees or demonising local councils for cuts made(forced by) by central government, you cannot come across as progressive if you are cutting services to hard and too fast. In hard times, the truth is always better. If the Lib Dems want to be a centre right party, behave like one and the road to oblivion awaits.